My hands were black with dirt as I came in from the garage, and I headed straight for the shower, after telling my son I was sure there were 10 spiders in my hair. Perhaps an exaggeration, but I couldn’t help but have the creepy-crawlies after sweeping that many spider webs out of the corners. The garage had been driving me crazy for months, so I tackled it. In several hours of hard work, I had the freezer defrosted, a huge mound of stuff taken to the church garage sale, shelves tidied, and floor swept. As I swept the last pile of dirt into the dustpan, my thoughts went to the comments of two women I had heard from the day before. One was a young mom almost despairing of what possible good purpose wiping snotty noses and mopping the floor could be doing in this dark world. One was an empty nest mom who was struggling to find the why in doing housework without the children around. I had been trying to find ways to encourage these two friends but was having trouble. 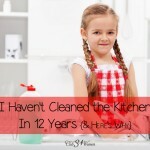 Why toilets and sweeping and laundry and dishes –the same day after day? Looking around at my now gloriously clean garage, I thought of the expression, Cleanliness is next to godliness, but this time I gave it serious consideration. Is cleanliness next to godliness? If so, why? Will you allow me to entertain a yes to that question and throw out some reasons why the job of keeping things clean is a holy activity? 1. The good news of Christ is that the dirty can be made spotless. The black-as-night heart can be made white as snow. Every time we clean our homes we show ourselves and our families and every guest that redemption is a possibility. 2. The good news of Christ is that chaos can be brought into order. Our lives were a disaster until Christ came in and swept out the corners and sets things right. Every time we neatly put things away in a cupboard or fold a towel with corners matching we mimic what God can do in the human heart. 3. The good news of Christ is that we are invited into the kingdom of light. Every time we dust an end table we admit that light reveals everything. Every time we clean a window we express an awareness of the goodness and warmth that light brings. 4. The good news of Christ is that he came to serve us, to give us life. Every time we clean we serve those who enter our homes. We demonstrate how important they are to us. 5. The good news of Christ is that our troubled hearts can find peace in him. Every time we clean we create an environment of comfort and peacefulness, a refuge from a messy world. We say, as Christ did to us, Come. Rest. 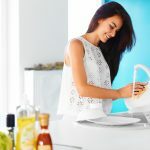 Keeping a shiny home is mundane work that seldom receives accolades, but it is important for more than just meeting health department standards or for gaining your mamma’s approval. 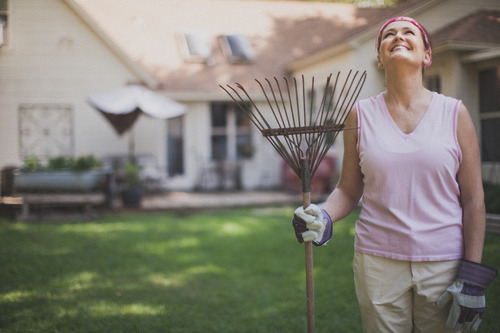 A clean house preaches a sermon of hope. So grab a broom, sister. It matters. As for me, I have a smelly toilet ring to tackle. 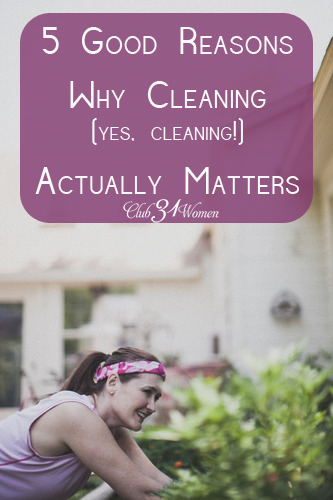 This is the best article about “Why” we as Christian homemakers should clean that I have ever read in my entire life. Thank you so much for sharing your wisdom with us! Amazing! I needed to hear this. Thank you! Planning to make your fabulous 5 reasons easily readable for my 5 little people and post it by our chore chart. You have just given our household chores eternal purpose. Christy, I hope you actually read this. God used this article to speak directly to my heart & soul today. I am a stay-home mom with one 10 1/2 year old son and “cleaning” is NOT one of my strengths. In fact, it is a serious challenge for me. I have printed this and am posting these reasons around my home to remind my that I am (1) Blessed to work “at home” and (2) have a purpose in caring for the home God has provided. Thank you for this wonderful perspective that I really needed. Okay, SO funny. My house is a bomb right now! I was sick for 10 days and have finally recovered and have picked up everywhere, but I’m afraid to even walk into my son’s bathroom because I can’t remember when he or I cleaned it last? So anyway, I’m encouraged by you, and I’m going to go re-read my own words about purpose in cleaning and then get a toilet brush. 🙂 Thanks for writing! It means a lot. My father passed away recently and cleaning out his apartment has been daunting. Thank you for this article it has inspired me This morning I go to my task with a much lighter heart after shedding a few tears. Oh, a huge hug to you. My father went to be with Jesus this year, too, and I have been grieving for him all over again today. I was just teary as I sat down here at the computer in fact, so I truly understand how you’re feeling. I was just home recently and helped mom clean out dad’s closet. That was a very painful task, but do you know we managed to laugh a lot, too? My dad had a few really ugly shirts leftover from the 90’s. 🙂 I pray Jesus will fill you with hope as you tackle the hard work you need to do. Someday heaven!! So, after complaining to God yesterday about housework and how pointless it is, of course I find this on my facebook page this morning. Thanks for sharing…I think. 😉 It’s going to take some work to see this as anything but a chore, but, here goes! Every single day I have to think about why cleaning is important before I can make myself do it. It is work to approach our labor with hope!! I have ADD (yes, it’s a real thing and yes adults can have it) and running a house, kids, meals, etc is the absolutely hardest thing for someone who has a brain affected by it. I love the Lord dearly but I fail in this area daily. The ADD person struggles with these tasks taking much much longer than average and so can never get on top of the whole house, I can spend a day in one room…and it goes right back. Just a never ending never successful battle that I was just thinking about as I looked around at my hard work today that would be most mother’s worst starting point, before reading this. It is a supreme effort and one that my husband who happens to be the type that really thrives in and needs an environment of order (hey we’re learning a lot about each other so that’s great) but still, quite the combination. Throw our precious beautiful 6 year old daughter who also has it in there and two other boys and ya it’s a lot. I thank God daily for my children but I haven’t had the best attitude about my home, so thanks for some godly motivation here, much needed for someone with other great qualities, like creativity and spontaneity 😉 but not that one. Well, I better get started on the 3 lunches for tomorrow. It takes me an hour. Us creative types -we so easily distract ourselves! 🙂 I don’t know how many times I’ve come downstairs to start laundry, only to think of a blog post and pretty soon I’ve been writing for an hour and the underwear are still dirty. Besides the easy distractability (is that a word? ), creative people also abhor the mundane and any kind of set routine. I keep telling myself, though, that I can’t use my artistic spirit as an excuse for living in a mess. It just takes more mental effort for me to do the chores. A dirty house bothers my spirit. Cleaning my house and putting things in order speaks peace to my heart and my soul. Plus it’s a wonderful way to show love to my family. This is awesome. I must confess that I struggle with the cleaning thing. I’m not a slob, but I live alone and sometimes it seems like it just doesn’t matter. This blog has been very encouraging to me. Many blessings and thank you. This is wondeful. I’d not really considered this as a reason to clean. We open our house a few times a week to young adults for bible study or meetings and I always have the house presentable, but this has actually given me a purpose to that clean. Rather than it just being for vain ideals. Thank you! I would like to make a poster with this 5 point list on it to display – would this be okay? Could I create some for my friends too? I know when I walk into a clean house it always feels like a gift. I imagine your young adults feel that, even if they never voice it. I think a poster is a great idea, but I’ll let Lisa give the okay on that one. Thanks for asking! Wow. This really gave me a fresh perspective on keeping my house. My husband and I got into a spat because he was pointing out little things that needed to be put away. I told him that if these things bother him so much, he should get off his rear and help out by putting them away himself. This was the night before he had to travel for business. Ugh…I should’ve just kept quiet and put the stuff away, with a more joyful attitude. Don’t you love those moments in marriage? Thank the Lord his mercies are new every morning and we can make fresh attempts at humble service. NOT EASY. I’ve wondered that as I’ve many times been a mentor in certain areas. And I try really hard to not meddle but just allow the person to come to me. Well now my meddling mom and I’s relationship has become much healthier as she has grown much! And it seems as though He is using ME (of all people…..she and I have always butted heads tremendously) to help her grow in understanding and love. It seems I have been chosen to help heal her as I am VERY familiar with her past and know what it is that has kept her from intimacy with her Father. Its amazing how He has moved in our relationship. Though she helps me a little too, my thought is don’t we need a circle of friends to walk with us so that we may also help each other? I’m not sure how to word that. Here’s a picture….. God is the head of the pastor and priority one is verticle relationship, the pastor has a ring of other pastors around him-horizontal relationships, then he mentors the church. But if you take away the middle relationships doesn’t that put the whole picture off balance? The hardest part is that it’s a service that rarely gets a thank you. We really have to persevere! Oh wow -that’s a huge life change! May God bless you in this new place you’re in. I’m glad you were encouraged! I guess I’m kind of weird because in general I like to clean. That being said, you have given me a fresh, new perspective on it! You’re wonderful! What a blessing to have a natural enjoyment for the work. Well, I will just say it! Cleaning is hard for me and I don’t prioritize it! I keep things neat and organized but the dust bunnies don’t seem to bother me as much 🙂 I appreciate this encouraging post! Thanks for taking the time to write it! Well, I didn’t mention that my own windows desperately need cleaning! I’m like you -better at keeping things tidy than actually cleaning. I think I wrote this post as much to encourage myself as I did to encourage anyone else! Wow! This was a great perspective that I had never even though about cleaning, while it can get so mundane now I can remember, “A clean house preaches a sermon of hope.” I love that!!! Thank You!